Well sadly my friends couldn’t make it this weekend – probably a good thing as I have still got the tail end of the nasty cough and cold bug I have had for a month so I have been snuggling up under a fleece on my stitching sofa watching TV and hand piecing. Much better for me than wandering round my beautiful but below freezing Yorkshire! I have recently discovered the joys of quilting videos on You Tube, as we have been doing the Block of the Month challenges and I find it difficult to follow written instructions so I thought a would share with you a few of my favourite channels in case you have not discovered this marvellous resource, it is like having a Quilt Guild in your very own home. Firstly the McCalls Quilting Channel. I have really enjoyed watching this Quilt Along learning loads of new techniques. Next is the Fons and Porter Channel, I have seen Mary Fons in lots of magazines and this channel has useful basic tips videos as well as interviews with quilters like this one. I found this Missouri Star Quilt Company Channel today and they have some brilliant videos on all types of blocks and whole quilts. Wouldn’t this one make a great quilt for a gift! I have always loved watching videos about quilting and have been a fan of The Quilt Show but didn’t realise that there was so much free stuff out there as well. Another thing I am a bit late to the party with is Craftsy, I have signed up from some fab free online classes for Block of the Months. 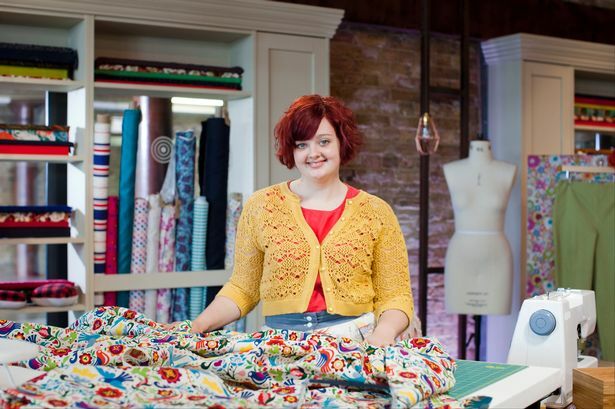 There has been great excitement here on TV this week as it is the start of series 3 of The Great British Sewing Bee! If you missed it here is a link to it on BBC iPlayer. I would not like to participate (my sewing is far too slow for that) but would love to have day in the workshop with all my sewing friends.What a fab venue for a day out surrounded by all that lovely fabric – and the little café with all-important cake nearby! Here is a picture of one of the contestants Deborah Simms with the beautiful fabric she chose for her final garment of this episode. Little Black Duck Blog is following the series with useful tips and tutorials for each episode – this is the post about this week and making trousers. Hope you find these useful, back to the sewing now- must spend equal time doing as watching or nothing will get finished 😉 ! See you in a couple of weeks and thanks for visiting. I’ve always wanted to watch the Great British Sewing Bee, as my European cousins love it. It’s a bummer we can’t watch it in the Commonwealth! Curled up under a blanket is a good response to the current weather, especially with a cold. Like you, I’m too slow for the Sewing Bee, but I like the way the judges always find something to praise before they pick out the failings! I know as a teacher trainer we always teach our students to use the ‘feedback sandwich’ approach, bit of praise, the bits that need improving and the final well done. I would be so tempted to enter but am the slowest sewer out and hate seeing myself in pictures or film so would be mortified!